Troy, a 6th grader at Harvey Scott School, has just finished leading our line of Bike Club participants, eleven 4th, 5th, and 6th graders. He has been in charge of deciding where we turn, how we navigate intersections, and, most importantly, how we stay safe on the road. He’s been demonstrating perfect turn signals and verbal communication to let everyone know what to do. Just in case, I’ve been riding in line two spots behind him, with one other student in between—close enough to coach him or step in if I need to, far enough away to give him the opportunity to make his own decisions on the road. But Troy hasn’t needed my help. Despite his nervousness—”It’s scary to be in charge of so many people’s safety!”—he’s done an excellent job keeping us safe. 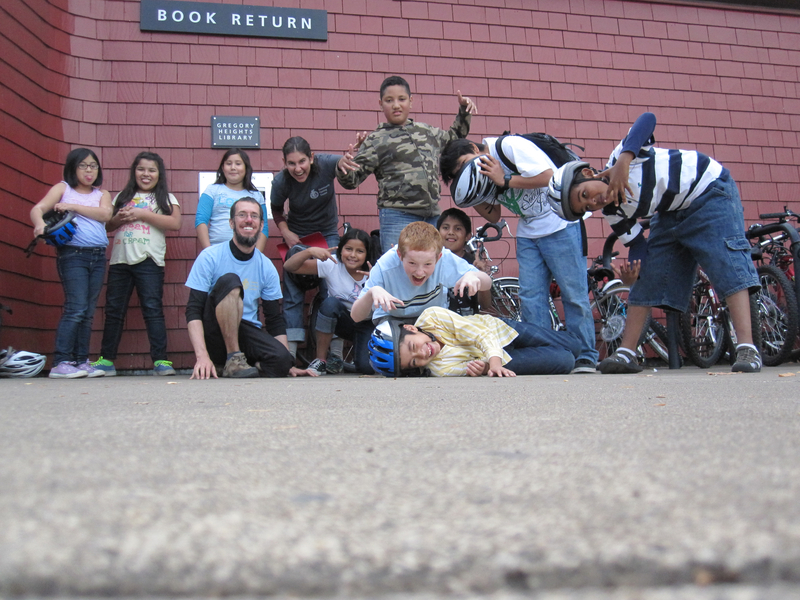 For the last four weeks, Troy and his fellow Bike Club participants have been learning how to bike safely and predictably, riding bikes donated by the community, refurbished by volunteers at the Community Cycling Center, and funded with a gift from the Bike Gallery. 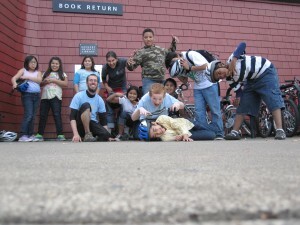 At the end of the six-week program, they’ll have earned their bikes. In the meantime, they have a lot of learning and riding to do. Troy, a shy kid who nevertheless stands out as a quiet leader in Bike Club, has known how to ride since he was four years old. “My dad taught me how,” he says, and he recalls with a smile how he and his dad used to race. “My dad always beat me,” he admits. But then his bike broke and his parents have been unable to fix or replace it for him. He’s excited about Bike Club, he says, not only because he can earn a bike for himself but also because he gets to learn how to ride to “cool places” on his own. What’s a “cool place” to Troy? 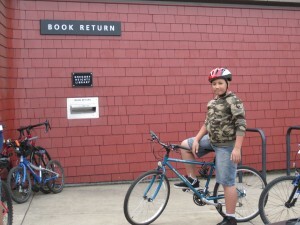 So far, he’s been most excited when Bike Club took a trip to the Gregory Heights Library. 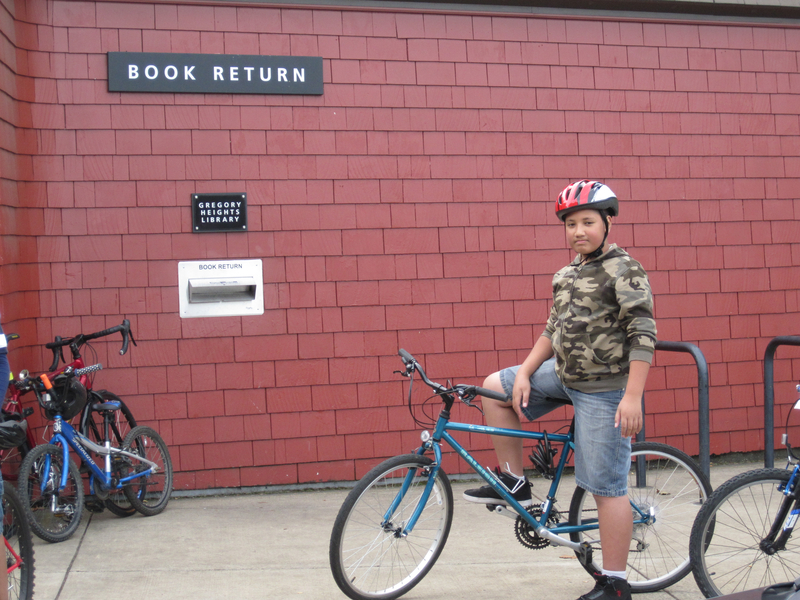 Though he was disappointed not to have his library card while we were there, he says that he’ll come back now that he knows how easy it is to get there on his bike. When he earns his bike, Troy is excited to be able to take rides with his family again—maybe even climb Rocky Butte, he says, so he can look over his neighborhood from above. And this time, with his fancy green Raleigh, he might even be able to beat his dad.